This lesson is a great place to start, and will help your students get acquainted with Tychos quickly. Students will learn how to navigate the Tychos interface. Students will learn how to create, use and modify comments, variables and built in functions. Students will learn about matrices and how to perform basic calculations (add, subtract) with matrices. Scientists and engineers create computer simulations that allow them to create virtual universes so that they can better understand the real universe. If the virtual universe behaves similarly to the way nature behaves, then scientists can assume that their simulation is built on similar rules - what we call a model. The simulation tool that you will be using throughout this course will help you test your understanding of the real world, and will even lead to discoveries about how the real world works. In order to build a simulation, you will first need to learn how to tell the underlying interpreter what you want your simulation to do. This requires learning the programming interface of the tool. A programming interface is essentially the language that the tool understands. Although this is not a computer programming course, you will be learning how to write some "code" that can be understood by the software that underlies the entire tool. When you write this code, you will be essentially writing a program that is executed by the simulation tool. We are going to start slowly by covering some programming terminology that you will need to be familiar with to start creating simulations. Follow this guide below to help you familiarize yourself with some of the basic commands and syntax of the tool's programming interface. To get started, you will need to click on the little wrench at the top left corner of the window below. This reveals several tabs, each with its own purpose. 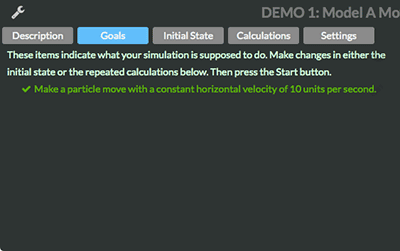 This is the description of the simulation, as well as any optional directions that can be identified by the simulation author. You program the initial conditions of the simulation, e.g. 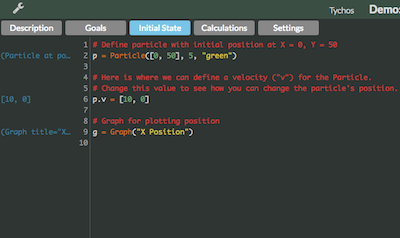 creating particles, setting their initial position, creating graphs to view particular aspects of your simulation, and perhaps defining initial values such as the gravity or mass. The code that you write appears on the left of the screen, while each line of code is evaluated and its output appears on the right in blue text. In this panel, you write your program for calculating what the simulation does for every moment in time as the simulation runs - called a frame. E.g. 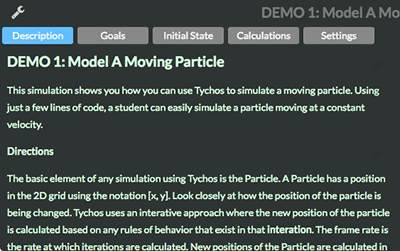 for a simulation of particles moving in space, you might examine several particles and calculate a new position for them given their existing momentum. Just as in the Initial State pane, the code that you write appears on the left of the screen, while each line of code is evaluated and its output appears on the right in blue text. A slider for adjusting the interval duration. 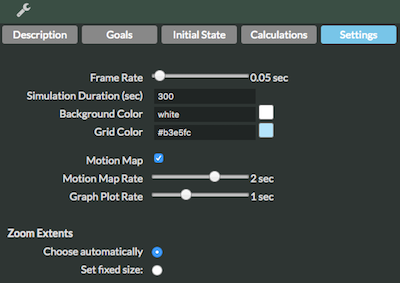 A slider for adjusting the plot rate for your graphs. To get started writing some code, you are going to need to go to the Initial State pane. Computers speak in languages that are very specific and precise. In order to communicate with a computer, we need to follow very specific rules. The second line of code will actually break the simulation engine. The software won't understand that second line of code, generating an error message. We will talk in more detail about how to interpret these errors later. For right now, just know that you can't communicate with the software using normal human speech - you are restricted to using the rules of language that the tool uses. The variables above have the same value, but they can have different values. These calculations get evaluated in the pane, and the resulting value is displayed on the right hand side of the pane in blue. # Wonder what that last line does? Notice in these lines of code that the function is defined by a name - like pow and sqrt and then you type an open parentheses "(" and then the input values for the function, and then a closed parentheses ")". The first function pow takes two inputs, the base and then the power. These are separated by a comma to identify the two inputs. Being that we need to simulate 2 dimensional motion, then we need a way to represent two dimensional quantities in our simulated universe. Tychos allows you to represent two dimensional quantities by using a matrix form for vectors. As you can see above, you define a matrix by simply identifying the set of numbers inside two brackets "[" and "]" and then separate the numbers with a comma. Can you see the pattern in the results? Notice how the calculation is performed on each number in the matrix. Now this gets really interesting when we start adding a matrix to another matrix. Matrix multiplication is an advanced topic that we will cover soon. There are special matrix multiplication functions that we will discuss later. Try this and look at the value of the matrix identified by the blue text and you will notice that it has indeed changed. Try changing the second element instead. This would be a position vector that represents a distance of 40 meters pointing at a direction of 120 degrees. There are two problems with vectors in this form. The first is that Tychos represents vectors as matrices, each element in a 2D matrix being equivalent to the X and Y components of the 2D vector. The second is that Tychos by default represents angles in units of radians, not degrees. It might be useful to know how to convert a vector given to you in the polar form above to a matrix in Tychos. You can do that using some of the built in functions that are available. The function deg_to_rad converts the angle in degrees to radians. The sin and cos functions are the trig functions from math to give us the lengths of the "legs" of the triangle where 40 is the length of the hypotenuse. Above we used the function mag that gives us the length of a vector and we used the atan function which is the arc tangent function from trigonometry. Write comments into your code. Create variables and give them values. Perform basic calculations with variables and values using operators and functions. Create 2D matrices and perform basic arithmetic calculations with those matrices.